I’ve installed previous versions of Openfire onto older releases of Ubuntu, but I have hit a wall this time. adduser: Warning: The home directory `/var/lib/openfire’ does not belong to the user you are currently creating. but it didn’t seem to help. Looking at the prerequisites for Openfire I saw no mention of Apache so I did not install it, is it required? Does anyone have any suggestions as to a fix? Do you have java installed? Is the command ‘java’ recognized? Does you have check for /var/log/openfire/error*.log? java is recognized. It shows me a bunch of options when I type that. I am running the script on Ubuntu 12.04 LTS, though I suspect it would happen on any other version. talks about how it can be fixed and I ended up modifying the shell script to point to http://www.oracle.com/technetwork/java/javase/downloads/jre6-downloads-1637595.h tml but that didn’t work either. openfire_3.7.1_all.deb "Debian package, no Java JRE… "
It is for Debian not for “Debian like” systems, so it probably doesn’t work on Ubuntu systems at all. Download and make a fresh installed Ubuntu 12.04 Desktop Edition for 32 bits. WARNING: This is not need if “echo $JAVA_HOME” point to a valid ORACLE Java 1.5 (or later) or OPENJDK installation path. 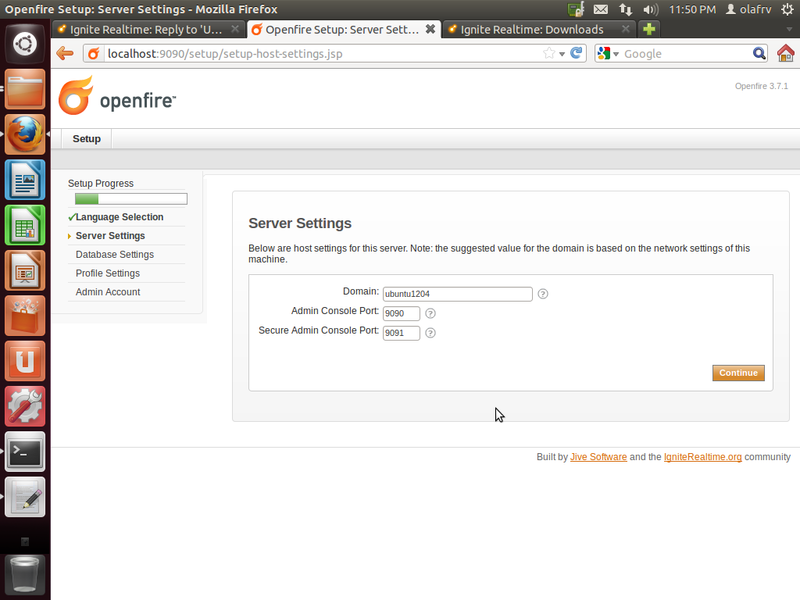 Openfire does not works with “gcj” which can be installed on Ubuntu, check installed version executing “java -version”. I’ve just successfully launched OpenFire 3.7.1 on LinuxMint 13, so I guess it should work on Ubuntu 12.04, 12.10 too. and it started to work like it should!